There are different dresses for different occasions. 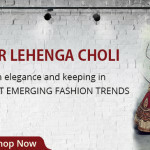 Lehenga choli is most popular Indian wedding dress which is also worn at Karwa Chauth. 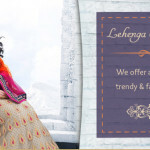 bridal lehenga, wedding lehnga cholis are gifted to bride by the maternal uncle in Indian weddings. 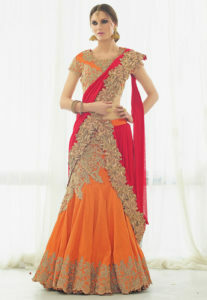 The Indian designers use heavy Occasional embroidery in bridal lehenga to gives beautiful look. Choli stands for short, tight fitted blouse, same as the one worn under sari. 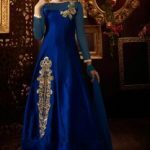 Utsav Fashion gives the latest and the largest bridal lehnga catalog from the Indian fashion including wedding lehenga, bridal lehenga and other indian wedding dresses for marriages and wedding. 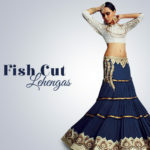 Lehenga or Ghaghra, the terms stands for almost similar piece of garment, which is a skirt with great deal of flare. The simple one have only one vertical seam which turn the cloth or ghaghra-pata into a tubular form, fastened with a draw string passing through a narrow slot at the waist. Flared ghagras are made of several panelsof triangular gored pieces stitched together.Accompanied by duppata completes the ensemble, to cover the upper part of the body. Well known among the Rajasthani, but this outfit has gained popularity and nowadays worn with greater relish and styles all over. The festival of lights enlightens our lives each year with memories of the past and illuminates our future with hope and joy. With the arrival of Diwali, special moments flood the mind. 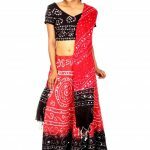 Ladies wear simple lehenga choli at this occasion. ‘Karwa Chauth’ is a ritual of fasting observed by married Hindu women seeking the longevity, well-being and prosperity of their husbands. It is popular amongst married women in the northern and western parts of India, especially, Haryana, Punjab, Rajasthan, Uttar Pradesh and Gujarat. This festival comes 9 days before Diwali on ‘kartik ki chauth’, i.e., on the fourth day of the new moon immediately after Dusshera, in the month of ‘Karthik’ In the evening, women dress up in special clothes, usually a red or pink sari or ‘lehenga-choli’ with gold woven ‘zari’ patterns. 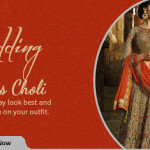 New brides often wear their bridal costume or good looking lehenga. All deck up in jewelry and wear ‘mehendi’ or henna patterns especially on the hands. Decorative ‘bindis’ on the forehead are a must for all women taking part in this celebration. During Navratri and Dandiya playing embroidered lehengas are in use. Eid is one of the famous festivals when Muslim women wear this costume. The most common occasion is wedding ceremony. Bride and other ladies are often seen in lehenga cholis and in fashion lehenga.